THE mystery surrounding the origin of the water seen swirling inside a sinkhole that opened up in a pensioner couple's back yard has been solved. 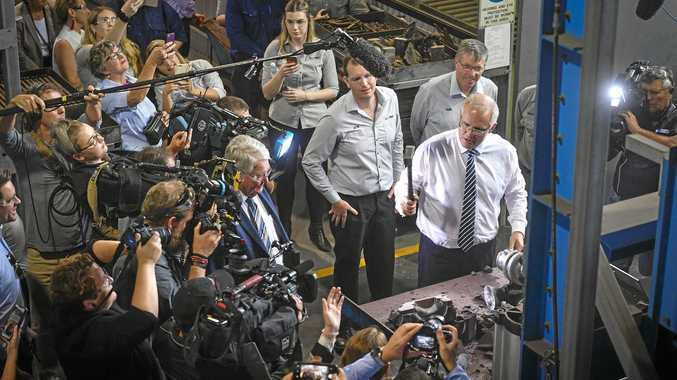 Lab testing undertaken by the Queensland Times has revealed the water's salinity levels were three times higher than the threshold for drinking water. But overall the water's chemical make-up was similar to fresh water and likely came from the Bremer River or rainfall. No toxins or environmentally harmful substances were detected during testing, which took longer than expected. Expert professor Jon Olley from the Australian Rivers Institute at Griffith University examined the results and said while the water was salty, it posed no threat to the river system. He says once the salty water hit the Bremer River - which is inevitable - it would dilute and have little impact on the river system. There was a constant exchange between rivers and surrounding ground water, Prof Olley said, meaning when the river was high water flowed into the water table and vice versa. But where did the salt come from? According to Prof Olley the salts were likely released from sedimentary rocks, known to cover the region. "If you leave a hole in the ground it will inevitably fill up with water," Prof Olley said. "Some of the rocks would have been laid down in a marine environment then uplifted, so that salt leaches out. "The salts are then absorbed by the water. "Put it this way, you wouldn't water your garden with that water because it would kill the plants." Sinkhole is swallowing back yard: Aerial vision shows how big the sinkhole is now. He said old mine shafts in particular were known to take in water at some point, although the high level of the water indicated this shaft was particularly full. 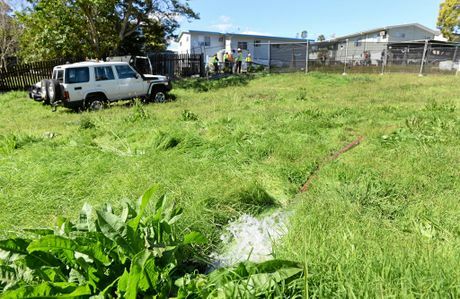 Before the sinkhole was filled in, the Queensland Government slowly pumped the water out into the gully behind the property which flows into the Bremer River. The public had been assured the water would be tested first, however, after representatives from the Environment Department inspected the site, it was decided testing wasn't necessary. The State Government assured the public there were no toxins in the water. The QT took samples to be sure no material that could have a negative impact on the Bremer River system had been released.